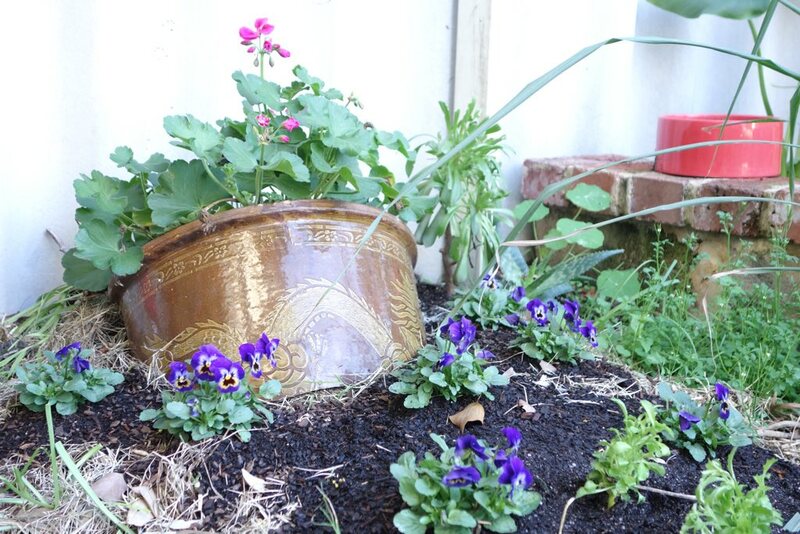 The flower bed has progressed, with the addition of pansies (Viola tricolor var. hortensis) and lobelias. I believe some native violets (Viola hederacea) have sprung up as weeds; not sure if that's actually what they are, but we've had them as weeds before. And on either side of the geranium (Pelargonium) at the back, I've planted aeoniums (Aeonium arboreum, also known as houseleek!). The bed is still a mess, though! This house has Hedera ivy and Virginia Creeper (Parthenocissus quinquefolia) all over it, which will serve as lovely coverings for the very plain fence. I'm expecting the aeoniums to grow to just above knee height as the geranium gets bushier and taller. With the rosemary and lemongrass too, this is going to be one odd flowerbed, but hopefully it won't look unattractive. I found a tiny triceratops in our yard, and for some reason, we have a tiny flowerpot too. I'm sure there are stories behind both, but their new life will be in a yet to be decided tableau. Would be nice if this was the start of a floral arc sweeping around that bare front section. Here is an experiment. The three arum lilies seem happy doing their own thing. So between them, I've placed the bottom half of the broken pot, filled it with soil and scattered cat mint (Nepeta spp.) seeds in and around. There might not be much to look at when the lilies and nasturtiums take over the bed, but when those die back, I'm hoping what's left is a lovely patch of catnip continually growing and self-seeding. In front, there's an osteospermum daisy to provide colour on a similar schedule. I'm not sure yet what to plant around it, but we're getting there. Maybe next week, I'll decide. After five years of playing in the garden, I'm satisfied that these things take time to cultivate - mentally and horticulturally. Time, however, is now something we don't have a great deal of. I thought we'd live here a couple years, but we've pulled the trigger on moving again, aiming for sometime in the next three months or so. I've decided that's my timeframe for making the garden presentable for the residents after us. So maybe next week, I'll have to decide. Harvested a little rainbow of radishes! They tasted sooooooo peppery and went straight into my pickle jar. We have coriander, garlic & chilli salt pickles now.